Ramblings of a Wildflower: Errands and birding do get along! Errands and birding do get along! Today was a day full of errands. Running to school for meetings, downtown for a bunch of little chores, grocery shopping, laundry....you know those days. I had been really hoping to set aside some time today to head up the river and take some photos of Goldeneye and a Long-tailed Duck that had been hanging around, but unfortunately, time seemed to have run out. In Peterborough, the No Frills grocery store is right beside a section of the Otonobee River, very close to Millenium Park. I will admit that I not only shop there for the lower prices....but also because I can park in the lot and make the excuse to bird a bit with the "but the river is just RIGHT THERE" excuse. That reasoning came into play today and I hopped on over to the pathway by the river to see a lot of movement! There were more mallards than I had seen all winter in this spot, as well as Gulls, and one lone Canada Goose. I am not very good at gull ID, in fact it is probably my worst guild to ID. 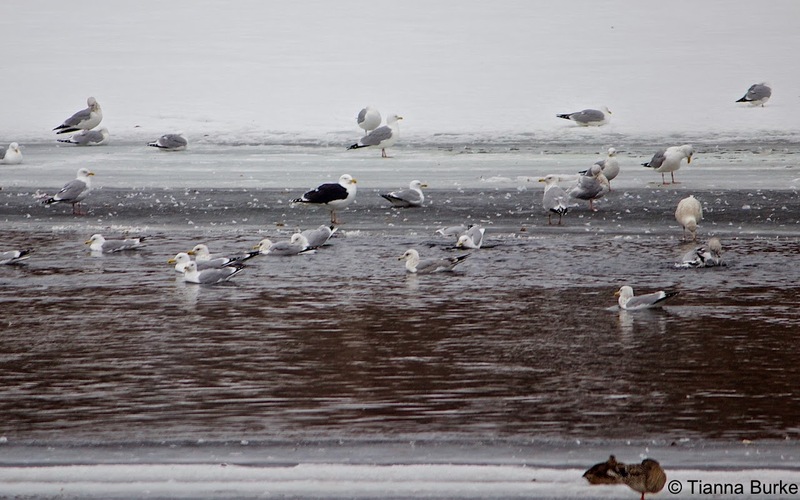 My first step was to count how many Herring Gulls there were amongst the Ring-billed Gulls. Check. As I was scanning I was very excited to note incredibly dark gulls! Thankfully I had seen Great Black Backed Gulls before...however the question of is it a great or a lesser came into my mind? Taking out my birding app I noted a key feature between these two species is leg colour. As this one had pinkish legs I know that I could ID it with certainty as a Great Black Backed Gull (GBBG). It is nice how these stand out so distinctly from the Ring-billed and Herring gulls. From the limited number of gulls I have seen thus far, I think these may be one of my favourites! 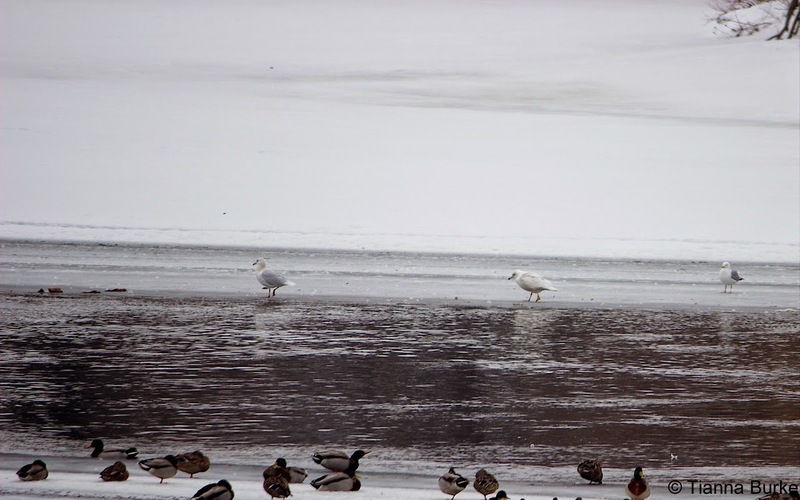 As I scanned the ice to count the number of GBBG's I noticed a few incredibly white gulls. In fact, they seemed to be almost pure white! 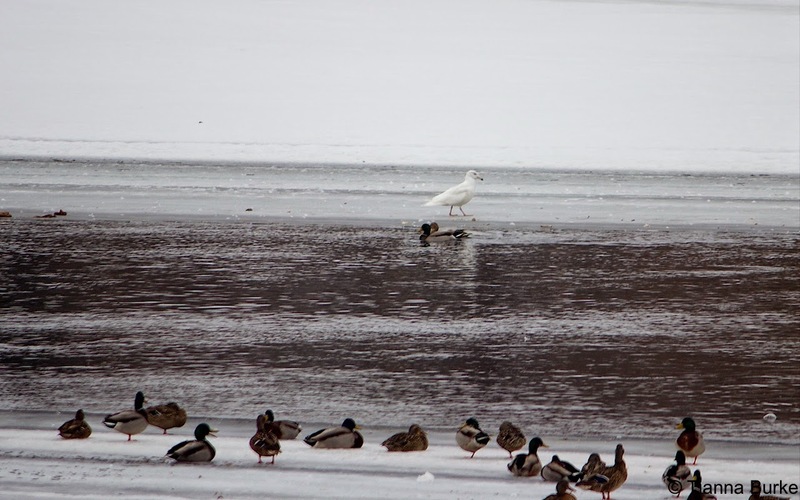 My initial thought was that they were Iceland Gulls, mainly because this is the only gull I knew to be pure white. I took a variety of photos so that when I got home I could scan through my field guide and get a better idea of what it could be. Looking through my field guide made me feel like Iceland Gull just wasn't quite right due to it's size, bill, etc. So my next option was a Glaucous Gull. This one is larger in size to a Herring (check) and as a friend of mine pointed out to me, had a bi-coloured bill (check!). Through these I was able to fully verify it was indeed a few Glaucous Gulls, which is a lifer for me!! Scanning one photo in particular (below) there is a perfect example of both an adult and a juvenile Glaucous Gull. The one on the left, is an adult. We can see that it looks remarkably like a Herring Gull, however it is larger and doesn't have the black wing tips. The one beside it, which is almost pure white, is the juvenile. 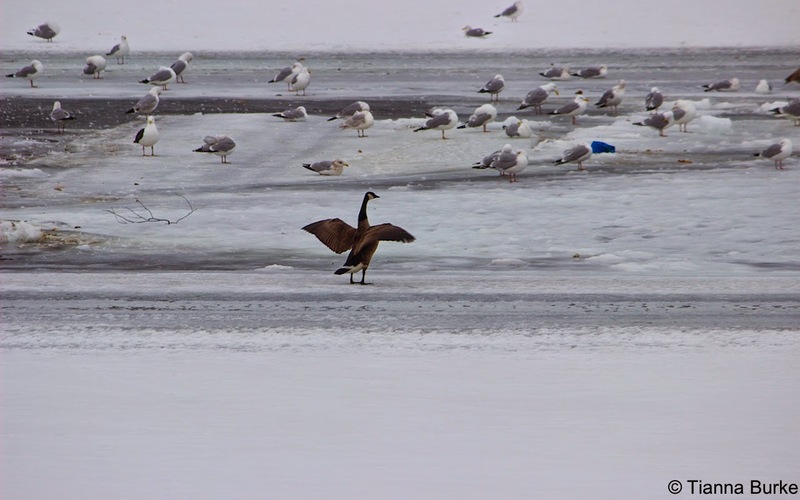 Being one of the only spots of open water around Peterborough, grocery shopping has definitely been one of my favourite excuses to get out and bird, errr... I mean do chores....eh. Hope everyone has been enjoying the last few days of warm weather! Spring is on it's way!